The perfect Conservation Gift from your family or child's class! The educational activities are endless: Counting, Estimation, Probability, Statistics, Creative writing, Art projects, and of course, Biology and Environmental Sciences. Your class will receive all the data from your nest when relocated, and again when it hatches. You will also receive photos of your hatchlings, and an Adoption Certificate for your classroom. 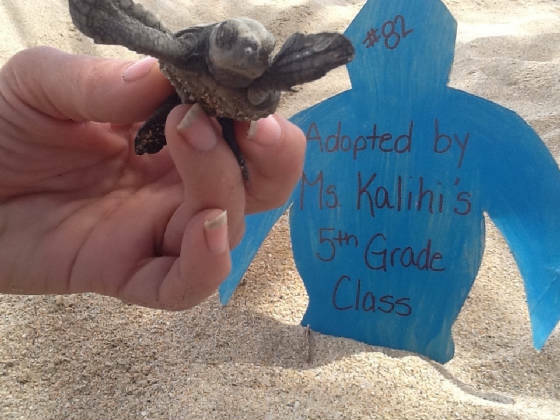 Adopt a Nest and Help Save Thousands of Sea Turtles! Your Participation in this Program supports Education programs, and Nest Protection programs!! Disclosure: Adopting a nest does not mean you get to bring home hatchlings. It is a fundraiser to raise money needed for conservation and education programs. It is possible to have a nesting season without Leatherback or Black hatchlings as they are critically endangered, numbers are still declining, and females nest every two to three years. 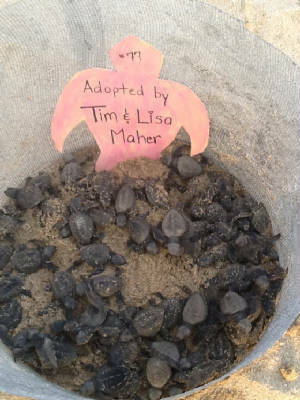 If there are no Leatherback or Black hatchlings during a particular season, photos and data for a prior season will be sent.